For many people, the bathroom is a sacred place; somewhere that instills a sense of tranquility and relaxation. It is also, being one of the most frequently used rooms in a home, one that is subjected to a lot of wear and tear. Make your fixtures elegant. Pedestal sinks and classic claw-foot tubs are much more attractive and graceful than traditional, blocky cabinet vanities and rectangular, dime-a-dozen bathtubs. A well put-together room is all about the lines that the pieces in it create and a bathroom is no different. Choose flooring that will stand up to water. Ceramic, marble and stone tiles are the best choices for the bathroom because they are more or less impermeable and will not soak up water. They are, however, not the greatest at retaining heat and do not create the same feeling of ambient warmth that well-sealed hardwood can. Create your shower area. Open concept showers are beautiful additions to any bathroom and their lack of curtains and doors creates a much less claustrophobic, more liberating feeling. These showers need well designed drainage systems and require overhead faucets in order to minimize spray and leakage, but are generally great at adding the sense of extra square footage to your bathroom. Share the space. In most contemporary homes, especially apartments and condos, space is at a premium. Consider creating multiple entry points to a bathroom that you share with other people instead of dual ensuite bathrooms that take up enormous amounts of precious space. Invest in your toilet. Toilets come in all shapes, sizes, functionalities and most certainly price ranges. You don’t have to buy top of the line in order to get something that looks and feels amazing, but you certainly don’t want to cut costs too much when it comes to this essential piece. Good quality, one piece toilets can be picked-up for around $400. 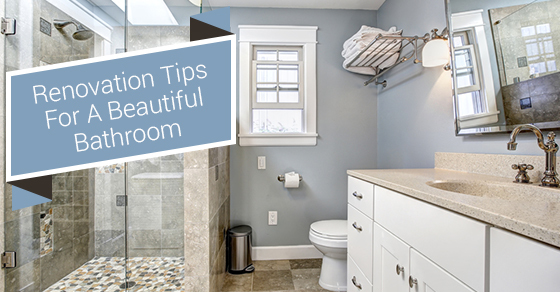 The bathroom may seem like a single-purpose room that doesn’t require as much attention as the less private, multi-functional rooms of your home like the living and dining rooms, but with some creative flair and some reliance on your inner elegance, you can create a room that satisfies both the functionality and spirituality requirements at the same time. For more information, contact the Avonlea team today!